Color: The rock dove is generally blue-gray with a white rump; has iridescent feathers on its head and neck; two broad black bars across each wing with a broad dark band across the end of the tail. They can also display brown, white or gray plumage. Characteristics: The standard pigeon has a short neck with a small head. Their short legs with the level front and hind toes allow them to perch on branches as well as walk on flat surfaces. Size: Adult pigeons are generally 32 – 37cm longs. Potentially Dangerous: Yes, to people and structures. Why Do I Have A Pigeon Problem? Pigeons are the number one urban pest bird and they exist in large populations in all cities across the United States. These birds are not afraid of people and will roost in man-made structures readily, especially protected ledges and roof tops. They have a diverse diet including grains, seeds, corn and human food scraps, which allows them to survive in many different environments. What Kind Of Threat Do Pigeons Pose? Pigeons are responsible for untold millions of dollars of damage every year in urban areas. Their feces contain uric acid, which is highly corrosive and can destroy the structures on which they roost. They can cause extensive damage to air conditioning units and other roof top machinery, as well as cut the life of a roof in half. People may also slip and fall on pigeon droppings which can lead to lawsuits and a company having a dirty or unclean image. The bacteria, fungal agents and ectoparasites that are present in pigeon droppings can also pose a serious health risk to humans that may breathe them in. 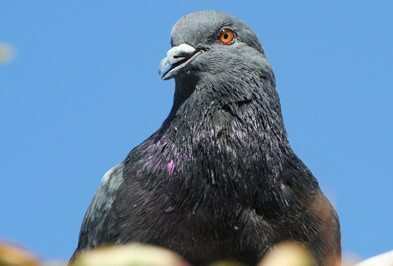 How Do I Control Pigeons? There are numerous products and techniques available to combat feral pigeon problems. Handling a pigeon infestation most often requires a combination of products and techniques. Coil, spring wire or bird point all have distinct merits for ledge applications. For exclusion, two inch netting is sufficient, be sure to use only woven and knotted netting for large applications. Any exclusion work should be coupled with some form of flock dispersal such as Avitrol, trapping or shooting. Flock reduction alone is not a long term solution as long as food and attractive shelter remain at the site. To find out how our bird control services in Houston can protect your employees, customers, product and facilities from pigeons and other pest birds, please contact us.